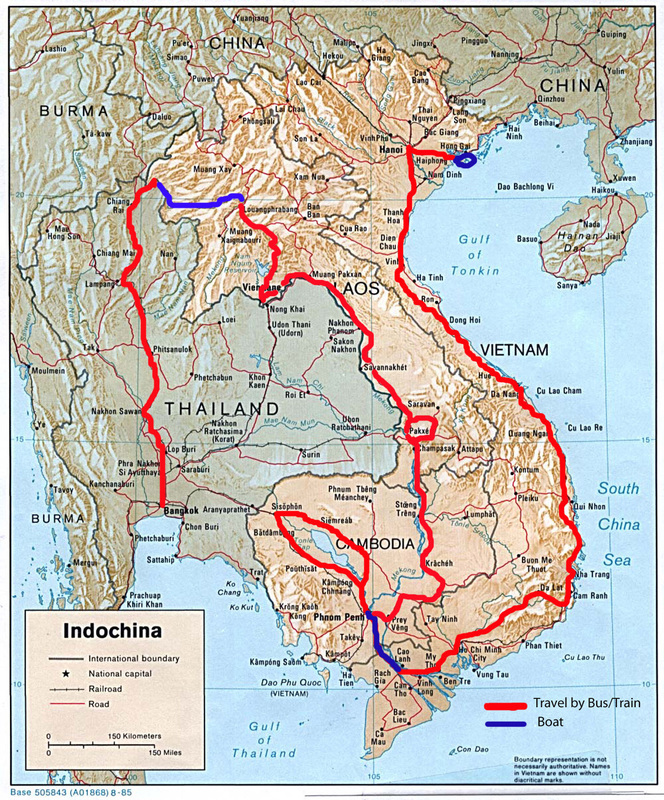 Travels Along the Mekong: Part III - Getting out of the 4000 islands! Pakse, Laos - So the 4000 islands is described as idyllic, quiet, timeless etc etc. I would agree with quiet. There is no electricity on the islands except for a few hours a night when the generators kick in. This wouldn't be so bad if the temperatures weren't so oppressive. Lonely Planet describes March-May as hellishly hot in the 4000 islands and they are right. We had planned on spending several nights on the islands but it was so hot and uncomfortable that we only stayed one night. It was 100F (35C) during the day with probably 80-90% humidity. Trying to sleep under a mosquito net in those conditions without a fan (or AC) was impossible. We did enjoy our one afternoon though. We rented bikes and biked around the island stopping at some impressive waterfalls where the Mekong narrows into a gorge and drops several hundred feet and also stopping to see an abandoned French locomotive. The French had built a short railway track the only one ever built in Laos but abandoned it almost immediately. Lunch at a restaurant along the Mekong, dinner at our guest house and a sleepless night and it was back to the mainland for our 2.5 hour bus ride to Pakse. We arrived in Pakse around 2pm and quickly found a nice hotel, with AC, Wifi and a few english tv channels. We could stay here forever! Pakse is a large (by Laotian standards) town of about 36000. We will probably be here a few days as there are a few interesting day trips and Pakse seems like a nice town. We had a good meal of Lao Style Noodles, pork in chili paste and a couple of cold Beer Lao's on our hotel's rooftop restaurant overlooking the Mekong. The 4000 islands were nice but way too hot for us to stay long. We actually ran into a couple that had been on our boat from Vietnam to Cambodia and they too had left the 4000 Islands after only 1 night because it was too hot.